I'm a big advocate of everything natural and healthy nowadays, doing a fitness regime with a sole aim of getting fitter and slimming down. To help me along, I'm really glad there's Juice Works to provide me with quick, healthy concoctions and drinks when I'm on the go. Committed to creating and hand crafting fresh fruit juices and healthy smoothies using only the freshest and most natural ingredients, I'm sold. 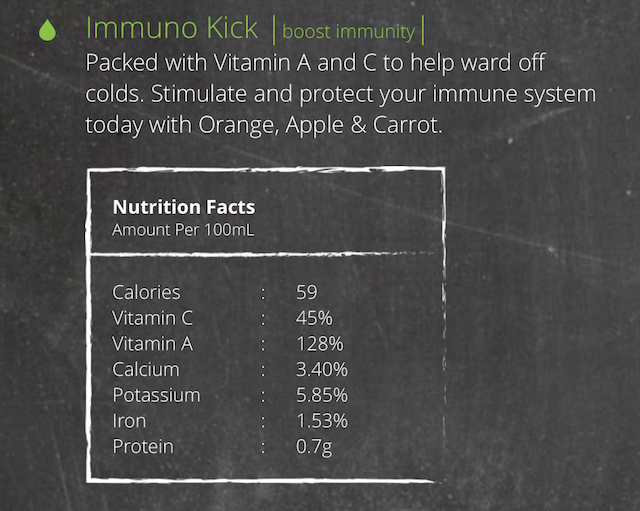 Today's post would be on my favourite drink, from the detox range, aptly named the Immuno Kick. With their new menu revamp, we have a huge selection of new juices, smoothies and more. I personally like juices way more than smoothies, as I don't like my drinks being too thick. With that in mind, I usually head for their detox range every time I order my drink. Juice Works' Detox Range comprises of Skinny Me (a spinach infused drink), Slimmer's Paradise, Super Star, Liver Tonic, Smooth Operator, Hearty Licious and my all time favourite Immuno Kick. The drink helps to boost immunity, containing a mix of fresh oranges, apples and carrots. It's packed with Vitamin A and C, with a slight sourish tinge. Overall it's still a rather sweet drink, but the best part is, everything's natural! Juice Works Malaysia offers over 30 choices led by the perennially popular Detox Juices range that includes carefully concocted drinks designed to support dietary goals, boost immune systems, soothe upset tummies or cleanse internal organs. The Berry Lovers range which blends zesty berries with low fat yogurts and other energising fruits is also a favourite alongside Tropical Paradise which holds the key to a rich repertoire of the exotic delights of sunny regions such as dragon fruits, lychee, jackfruits, mangoes and melons. 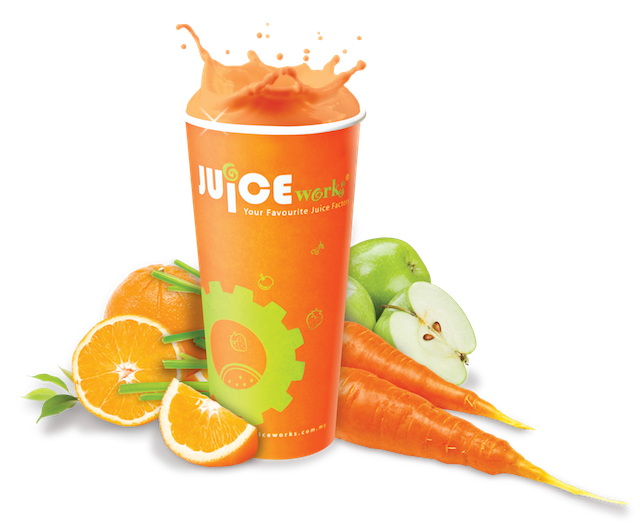 Their Juice Baristas are always happy to accomodate your every needs and our info@juiceworks.com.my is always available to address any concerns and questions. 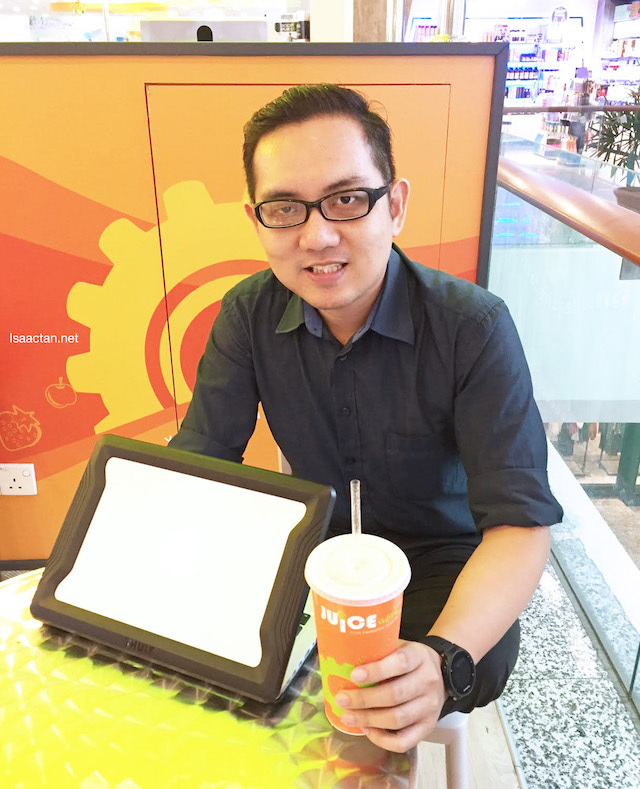 Juice Works specializes in creating fresh fruit juice and smoothies that not only taste great but is healthy. So have you gotten your cup of Juice Works today? Get it NOW! *Take a half of pineapple and hack it into cuts. 400g of cut pineapple pieces that would suffice then get a new pack of cleaved mint leaves, and you would likewise require 5g or 1cm of ginger piece to give the ginger flavor to this formula.